The La Flor Dominicana TAA 50th Segunda Edition Box Press Toro will be available in natural or maduro wrapper. The members of the Tobacconists’ Association of America have a dozen new exclusive cigars made just for the organization this year, along with eight other cigars that were offered previously and are again being made available to TAA members. Most will appear in stores within a month or two, while others are expected to come out later in the year. Brick House Ciento Por Ciento is named for the Spanish way of saying “100 percent.” The smoke is made entirely from Nicaraguan tobaccos and was originally sold in Germany. This cigar isn’t in the normal style of Brick House, but it’s stronger. “It’s a heavier blend,” says Bobby Newman of J.C. Newman Cigar Co. The one-size smoke measures 6 1/4 inches by 54 ring gauge, and will be limited to 500 boxes, each containing 25 cigars. It will retail for $7.40. The company expects it to ship in May. General Cigar is bringing back CAO Brazilia Select, a limited-edition smoke from years ago. The cigar is all about the wrapper, says General president Regis Broersma. The smoke is cloaked in a dark, Connecticut Habano leaf, has a Brazilian binder and a mix of Honduran, Dominican and Nicaraguan filler. Only 1,000 boxes will be sold, each containing 12 cigars. The cigar measures 6 1/2 by 60 and is slated to retail for $8.99. Expect it to be shipped in April. Pete Johnson’s Tatuaje Exclusive Series TAA 51st is named after the 51st year of the show. The smokes are 5 by 52 with an uncut foot, giving you a quick blast of the Mexican San Andrés wrapper upon the light. The rest of the tobacco is Nicaraguan, and the smokes are made in Nicaragua at My Father Cigars. Only 3,000 boxes are being made, each with 20 cigars. Retailing for $11.95 each, the cigars are packed without cellophane, wrapped in paper and then in foil. For now, Johnson is keeping the cigar band a secret. The Garcia family has introduced Don Pepin Garcia Original Toro, a familiar name with a twist. While the originals are made in the United States, this version is rolled in the company’s massive My Father Cigars factory in Nicaragua. Packaged 25 cigars per box, the Toros are entirely Nicaraguan, retail for $10 each and measure 6 by 54. This will ship in April, and will be limited to 1,250 boxes. Crowned Heads brought back its The Angel’s Anvil cigar, a TAA exclusive that’s made with a new blend each time it appears. This is the sixth version, and combines Brazilian wrapper, Ecuador Sumatra binder and Nicaraguan filler. The 6 1/8 by 50 cigar retails for $11.75. Only 1,000 boxes of 20 will be produced. Look for it in May. New World by A.J. Fernandez Redondo marks the first time in the Nicaraguan brand’s history that it will be offered in the round, rather than as a box-pressed smoke. It’s a Nicaraguan puro, selling for $8, and measuring 6 1/2 inches long by 55 ring. Only 1,000 boxes will be produced, each holding 20 cigars. The Redondos will ship in May. Christian Eiroa is returning to his Honduran roots with the release of Eiroa Jamastran 11/18. This Honduran puro is a perfecto measuring 6 1/4 by 54 at its fattest point. Packed 18 to the box, the cigars ($16.50) are expected to reach stores in May. A robusto version will be made available to stores that aren’t part of the TAA. EPC Cigar Co. is coming out with a limited version of its Historia blend. Called E.P. Carrillo Limited Edition La Historia TAA 656, the cigar has a wrapper from Mexico, a binder from Ecuador and Nicaraguan filler leaf, something cigarmaker Ernesto Perez-Carrillo enjoys working with on a regular basis. The $11.50 cigars will come in boxes of 10, measure 6 by 56 and should ship by June. Last year, La Flor Dominicana crafted a box-pressed piramide for the TAA show. 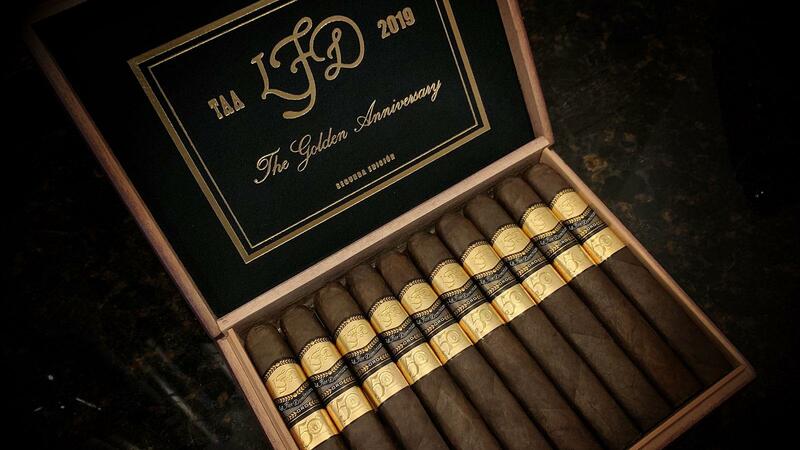 This year, that blend returns in a new size, the La Flor Dominicana TAA 50th Segunda Edition Box Press Toro. Available in natural or maduro wrapper with filler that includes some Criollo ’99 tobacco, the flattened 6 by 54 smoke has a $20 suggested retail price. The natural wrapper is Nicaraguan, while the maduro is Mexican San Andrés. This one comes in boxes of 20 and won’t be on sale until fall, probably October. La Palina Silver Label is made from a multi-country blend. With Honduran wrapper, a Costa Rica binder and a mix of Nicaraguan, Costa Rican and Honduran filler, the 6 1/2 by 52 smoke retails for $9.99. Only 1,000 20-count boxes will be produced. Nat Sherman International is releasing Timeless 2019 TAA Limited Edition, a Dominican puro that will come in boxes of 10 and retail for $14.50 each. According to Nat Sherman, the 6 by 49 cigar is full-bodied and only 1,500 boxes are being made. Look for it in April. Joya de Nicaragua plans to release two TAA-exclusive cigars, one that's a reissue of last year's TAA-only release, and a new cigar for 2019. Antaño Gran Reserva Presidente, which was the company's 2018 TAA exclusive, is being re-released this year. The second is a new cigar called Selección de Torcedor 2019, whose blend was chosen by the rollers at Joya de Nicaragua. Both cigars will retail for $12.50 per cigar. The release is limited to 1,000 boxes, and should ship in April.